Whether or not you’re as food crazed as I am, everyone has food memories they associate with the holidays. Growing up, the appetizer table at Christmas dinner always included a smoked salmon platter, sometimes paired with a dill cream cheese, and often garnished with cucumber and lemon slices. So, when I was asked by the team at Off The Grid to participate in a promotion where Toronto cocktail fanatics were asked to create a holiday tipple using Belvedere vodka*, my thoughts turned to one of my favorite holiday food memories. Those who’ve followed this blog know I’ve never shied away from unusual cocktail ingredients or smoky flavours (truthfully, I have a strong preference for brown spirits), so putting together a cocktail reminiscent of a smoked salmon platter was a welcome challenge. The result: The Smoked Sammon (The name is a play on the name of the street I live on… and a reflection of the fact there is definitely no actual fish in this drink!). To make this drink, step 1 is infusing the vodka with cucumber and dill. Peel, halve and de-seed half an English cucumber, then chop the halves into small chunks. Throw the cucumber into a mason jar, or any container with a tight seal, along with a handful of fresh dill. Pour in half a bottle of Belvedere vodka and close the lid. Store in the fridge for three to four days to infuse, and give the jar a gentle shake once a day. Step 2: create the “smoke” for your cocktail. For this, I made a smoked paprika simple syrup, an idea I borrowed from Toronto chef Matt Kantor. Heat 1 cup of sugar, 1 cup of water and 2 tablespoons of smoked paprika in a saucepan over medium heat for 10 minutes or so, until the sugar is dissolved. Let the syrup cool completely, then store in the fridge in a Tupperware (it’ll keep for several days). Finally, make your drink. Fill a cocktail shaker with ice and shake together 2 ounces of the infused vodka, half an ounce of your smoked paprika syrup and a few dashes of citrusy bitters to round things out (I used Bittered Sling’s Lem-Marrakech Bitters). Pour into a cocktail glass over ice, and garnish with a slice of cucumber from your infused vodka. *Thanks to Belvedere and offthegridto.com for supplying me with a bottle of vodka to play with. To check out more cocktail creations, visit Off The Grid. If such a thing exists, I definitely have culinary ADD. When I got my ice cream maker a couple years ago, I made ice cream obsessively for weeks and weeks. Then I stopped. Then I started again when the ice cream bug hit me. When I discovered ramps, I cooked with them all the time for a really brief stretch (of course, that’s partly due to the fact that ramp season is so short). A while back, I discovered lapsang souchong tea. We went for high tea to celebrate my mother-in-law’s birthday. When they brought around the sampler box for everyone to smell the teas and choose the one they wanted, I was instantly drawn to the one that smelled like a campfire. Lapsang souchong is made of mountain-grown tea leaves from China, smoked over pine needles. It’s basically the tea-drinking equivalent of a peaty scotch, or a cigar. And while the intense flavour meant I could only drink one cup of the tea, my brain instantly went to the idea of cooking with it. Jenny and I did just that last year, preparing fish two ways with lapsang souchong. And then, of course, I forgot about my smoked tea leaves – until just recently, when I started thinking that lapsang souchong might make for an interesting ingredient in cocktails. I started this by making a simple syrup with a 1:1 ratio of sugar to brewed lapsang souchong tea (instead of the water normally in simple syrup), which I left to cool. In the glass, I muddled a thin sliver of orange rind with three dashes of bitters and 0.5 oz of the simple syrup. To that, I added three ice cubes and 1.5 oz of bourbon. The end result is decidedly Old Fashioned, but with a distinctive smoked flavour that lingers after the sweet and citrus notes fade. 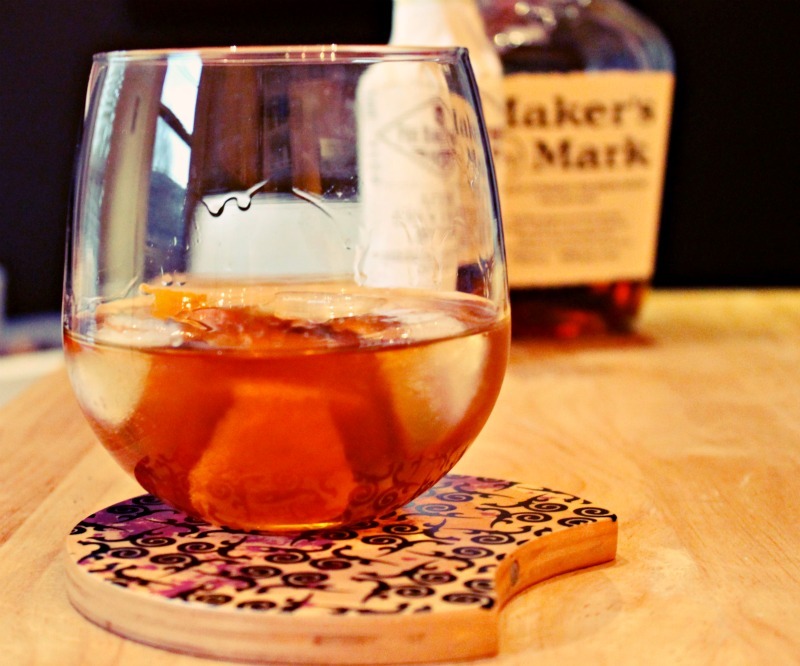 I’m more of a Manhattan guy as brown liquor cocktails go, but I can definitely see adding this to my home bartending repertoire. Have you used lapsang souchong tea in your cooking or drink mixing? Jenny and I love cooking shows based around secret ingredients, like Iron Chef and Chopped. So I was intrigued when I discovered Kitchen Play—a website built around that very concept—earlier this year. The site invites food bloggers from across North America to participate in monthly “progressive menus.” Bloggers are assigned to develop a recipe for a particular course, using ingredients from a sponsor organization. We were excited and up for a challenge when Casey at Kitchen Play contacted us to be part of the February menu. But we never could have expected just how challenging this particular challenge would be. Our course: a cocktail. Our secret ingredient: Beef, courtesy of sponsor Canadian Beef. Translation: Make a beef drink. Our research quickly uncovered the fact that there aren’t too many alcoholic concoctions containing beef, aside from variations of the Canadian classic, the Ceasar, which incorporate beef stock. Then Jenny had a revelation—tamarind, the sour-sweet fruit common to Mexican, Thai and Indian cooking. We’d had a tamarind tequila in Mexico a couple years ago, and knew the flavour would complement the rich, earthy taste of beef. And so, after a bit more thinking, testing and drinking, the Moogarita was born: a combination of tequila, pure beef stock, tamarind, and lime-ginger syrup. 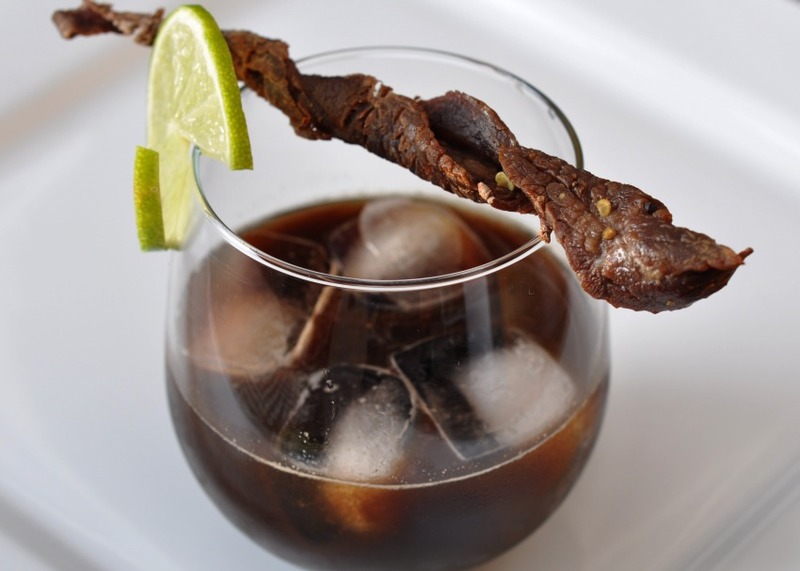 And to beef it up even more, we garnished the drink with sticks of homemade jalapeno and lime beef jerky. To make the Moogarita, we set out to find the purest beef stock and found some at a local market made from Canadian beef bones and water. That’s all there is to it—no added salt or flavourings, which makes for a very pure and clean tasting stock that doesn’t overshadow the other flavours in what turned out to be a delicious drink. With its tart citrus taste, the Moogarita is similar to a classic margarita, but with a richness from the beef stock and a sweet-sour bite from the tamarind and ginger-lime syrup. If you can’t find tamarind paste or concentrate (widely available in Asian and Indian food stores, as well as in ethnic food sections of many grocery stores), we’ve discovered that HP sauce—which actually contains some tamarind—is a reasonable substitute. Check out our recipes for both the Moogarita and the beef jerky garnish below—and read on to find out how you can win $100 from Kitchen Play by recreating this recipe or others from the February menu! To thin tamarind paste, put about a tablespoon of it into a bowl and whisk in about a tablespoon of warm water, a little bit at a time until you get a smooth, thin, syrupy consistency. Set aside. Put 3 or 4 ice cubes in a cocktail shaker. Add tequila, beef stock, ginger-lime simple syrup and tamarind. Shake well. 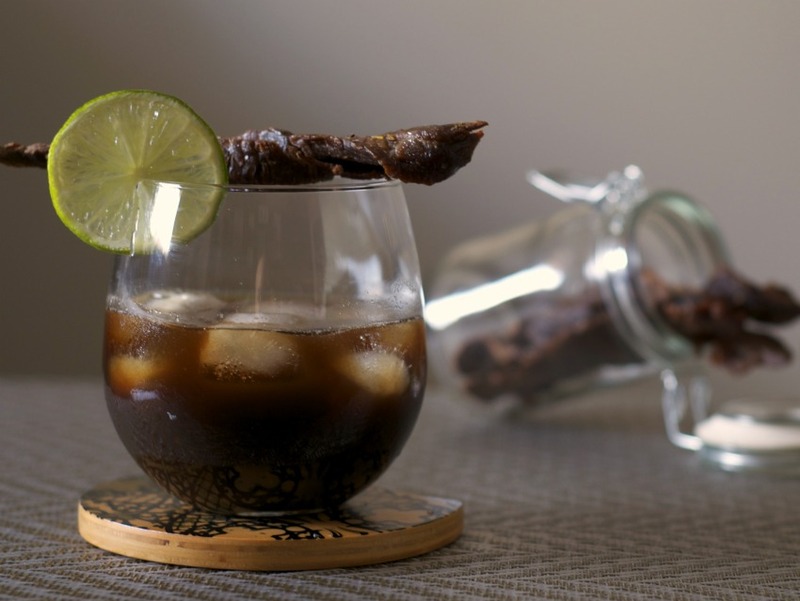 Pour into a highball or margarita glass and garnish with jalapeno-lime beef jerky and a slice of fresh lime. *Tamarind paste can be found at many specialty stores and ethnic grocery stores. If you can’t find it, you can substitute ½ oz of HP Sauce, which is similar in flavor with a bit more spice and bite to it. Bring lime juice to a boil in a small saucepan. Add sugar and ginger, and lower heat. Simmer and stir for 5 minutes, or until sugar dissolves and ginger infuses syrup. Let cool. You can strain the syrup to remove pieces of ginger, but we decided to keep them in to add more flavour to the drink. Makes about 2/3 cup of syrup. Syrup can be stored in an airtight container in the fridge for about two weeks. In a large bowl, whisk together lime juice, tequila, tamari soy, brown sugar, salt and pepper until the sugar dissolves. Stir in jalapeno. Place beef strips in a glass baking dish (or other non-reactive receptacle) and pour marinade overtop. Cover with plastic wrap and marinate in the fridge for at least 6 hours (overnight is best). Preheat oven to 175 C. Remove marinated beef from the fridge, and place slices on paper towel. Remove any jalapeno seeds stuck to the beef if you want a milder beef jerky. Using more paper towel, pat the pieces dry to remove excess liquid. Line a baking sheet with tin foil. Arrange beef slices flat on sheet without overlapping. 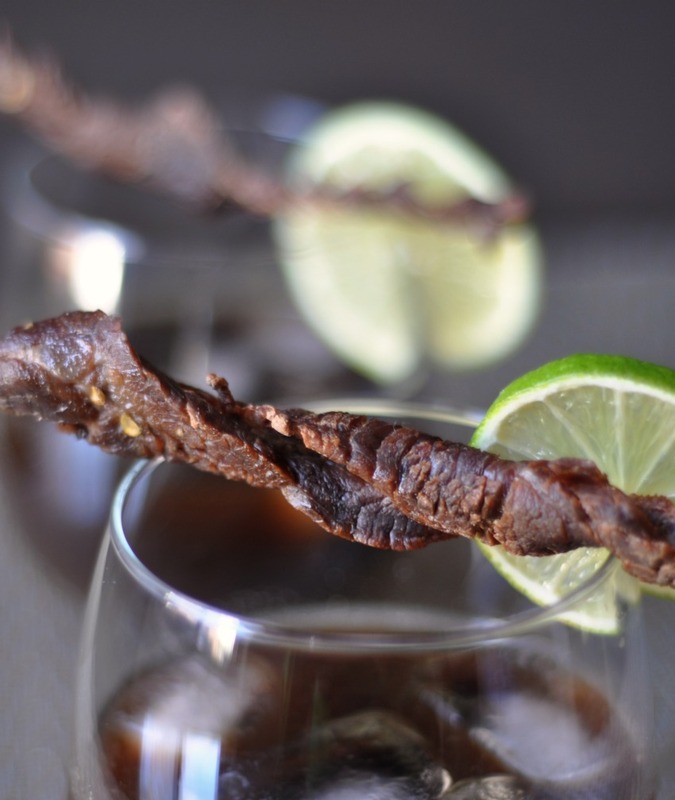 For a more stylish-looking jerky, twist the slices of beef before placing them on the baking sheet. Sprinkle with sea salt and place in oven. After 1.5 hours, remove the baking sheet and flip each piece of meat over. Put back in the oven for another hour. After another hour, check to see how dry the beef is, flip slices again, and put back in the oven for an additional half an hour if needed. The goal is for the jerky to be as firm and dry as possible, without getting too brittle. 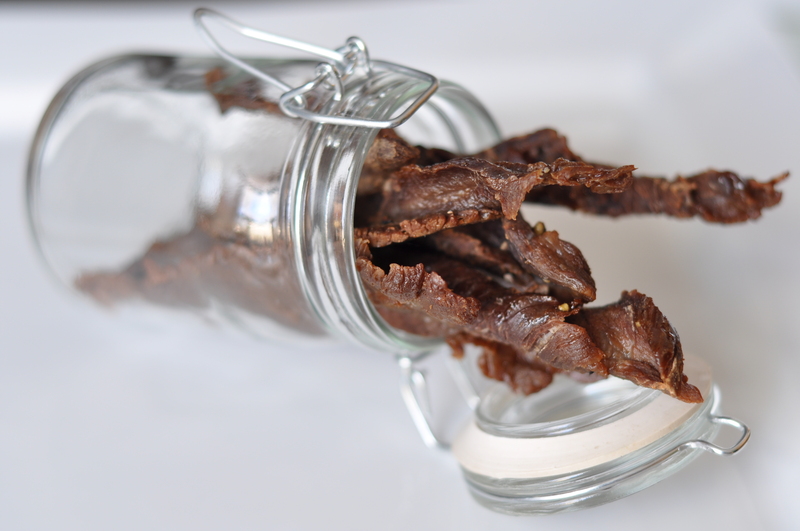 When sufficiently dried, remove jerky from oven and let cool. The beef will dry further as it cools so make sure not to overcook/over-dry in the oven. Enjoy as a garnish for the Moogarita—or on its own! * Special thanks to our friends Sue & Chris Pink for the beautiful photography. Up for a challenge of your own? Want the chance to win $100? Recreate this or any of the other recipes from February’s Kitchen Play menu, then post about it. Read the full contest rules at kitchen-play.com/contest-rules.